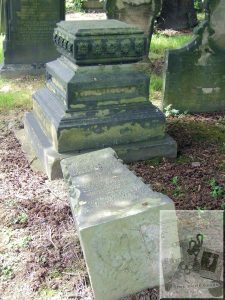 Over the past few years, I’ve photographed hundreds of headstones in Sugar Lane Cemetery, Wakefield – the reason, well it’s to do with a project I’m researching that is well on its way to being completed. Along the way, I seem to have amassed a number of photographs of interesting headstones. Interesting either by a name, a deed done, an occupation, place of birth or death or how the death occurred. The headstone remembering John Rogers is one of those, falling into the latter category. The photograph of John’s headstone recently formed part of a display I had done at the monthly meeting of the Wakefield & District Family History Society. At one of their committee meetings, I suggested a display to be a focal point and promote conversation, as opposed to the members and visitors getting their ‘cuppa and a biscuit’, then sitting down to await the speaker. The displays worked and each month features a different subject. Previous subjects have been weddings, Lady Pilkington, Polly’s Story, Remembrance and The Titanic – with more interesting subjects lined up! Anyway, back to John Rogers, Mason of Wakefield. John was born in the village of Staincross in 1826, possibly son of John Rodgers, ag.lab, and his wife Hannah. By 1851, John had moved to Wakefield, was a married man and a father, living on Wrengate Sun Lane (could this have been at the junction of both roads?). He had married Elizabeth (nee Shillito ?) around 1849 in Wakefield and by the time of the census their son, Walter was five months old. As he had done in the previous census, John gave his occupation as a mason, while his wife’s entry was not left blank as other none-workers had been, the census enumerator had entered for every wife without a paying occupation entered ‘Attends her home’. I must add that his enumerator’s writing was clear, readable and quite a pleasure to look at. A further ten years on in John’s life, 1861, he is living in Stott’s Yard, working as a stone mason (journeyman). John is 35 years of age and Elizabeth is 40. Their family has grown a little – Walter is 10 and attending school, Pheobe is two and little Rowland is one month old. The age gap between Walter and Pheobe leads me to believe the couple had a few sad years before Phoebe was born as there are quite a few entries for deaths between 1850 and 1859 in the Wakefield area that could fit this family. John during his working life had worked on the spire of the All Saint’s Church, Wakefield, now Wakefield Cathedral, but it was while working on the magnificent memorial to the Shaw family that John lost his life. Monument To The Late John Rogers – on Thursday last, a monument was erected in the cemetery to the late John Rogers, stonemason, who was unfortunately killed some time ago by a fall from the monument of Mr. Shaw, in the cemetery, which he was erecting. The stone, we understand, was given by Messrs. Latham and Son, and the old fellow-workmen of Rogers dressed and prepared the stone after their day’s toil, out of respect for the deceased, who was much esteemed by his friends. 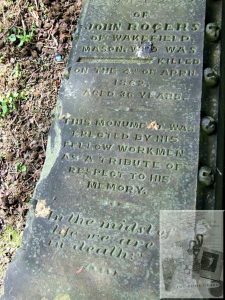 The stone bears the following inscription:- ‘Erected to the memory of John Rogers *** Wakefield, mason, who was accidentally killed. 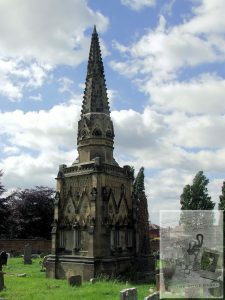 This monument is erected by his fellow-workmen as a tribute of respect to his memory.’ Rogers did all the crocket work belonging to the spire of the parish church, and when he had finished, he ascended to the top without rope or ladder, a feat which was allowed to be more daring that Steeple Jack’s feat about a fortnight ago. From the newspaper article, it seems that John was well liked, being a good member of his community and respected by his fellow workers. What more can you ask in life or death? After his death, Elizabeth, his wife wrote to the Friendly Society of Operative Stonemasons of England informing them of John’s demise. The Fortnightly Returns records held at Warwick University according to their online index hold – Application for accident provision; Letter of thanks from widow, Elizabeth Rogers; Information regarding the memorial. From 1840 onwards members were eligible for sick pay, superannuation and accident pay and benefit. The records also include fines levied on members for offences such as working for too little pay, fraud, theft, offensive acts in a lodge house or ‘tattling’ to an employer. It is known from the newspaper article mentioned above that the working on John’s headstone included the words ‘accidentally killed’ but the headstone now laid in a prone position has had the word ‘accidentally’ removed. Who had the word removed? Was it his fellow workers removed ‘accidentally’ as an afterthought? Or did his wife, Elizabeth ask for the removal? Does anyone know? This entry was posted in General on April 22, 2018 by carol.